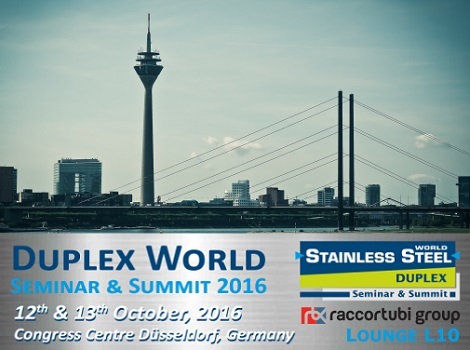 Ever-involved in Duplex World, Raccortubi Group is proud to be sponsoring the 2016 Seminar & Summit. This year the event will be taking place at the Congress Centre in Düsseldorf, Germany, from 12th to 13th October. With duplex stainless steels playing an increasingly important role in a range of applications, particularly in the Oil & Gas and processing industries, Raccortubi has felt it more important than ever to support the specialised event, contributing its experience and expertise. The event itself will centre around high-quality seminars consisting of lectures, workshops and master classes addressing current technical, market and application issues. Subjects range from the manufacture of duplex stainless steels to their specifications and use, with a strong emphasis placed on practical, application-based experience. Meanwhile, the accompanying exhibition will give leading producers and suppliers, as well as processors, material experts, engineers and scientists, the opportunity to meet and discuss important topics. Raccortubi Group will be present at Lounge L10. Should you wish to find out more about the event, please visit: www.duplex-world.com.